After breakfast with Chistopher this morning I stopped at the Bliss Coffeehouse once again to finish this sketch that I began last week. I would advise everyone who is traveling through southern RI on route 95 to get off at exit three and visit this coffee stop. It is in the same plaza with the Ocean State Job Lot. It is an unexpected surprise when you walk through the door. One moment you are in a plaza in Wyoming RI and the next you are in Soho, or the Village, with wonderfully comfortable surroundings and always great music. You half expect Audrey Hepburn in black tights snapping her fingers to jazz and dancing in the shadows. 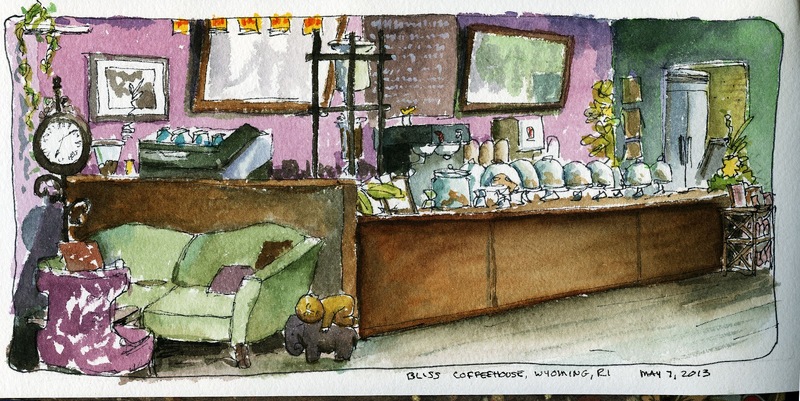 And above all the Dixie and Chuck offer you great service and wonderful coffee. I suggest that you try the cold brewed iced coffee. This sketch is the first in a new sketchbook and I finally have my long rectangle to paint on. I am not too happy with this little sketch but as always, I am hoping to improve. After work I drove into Providence and ended up here at the Memorial Park along side of the river to wait for my friend Edrex. 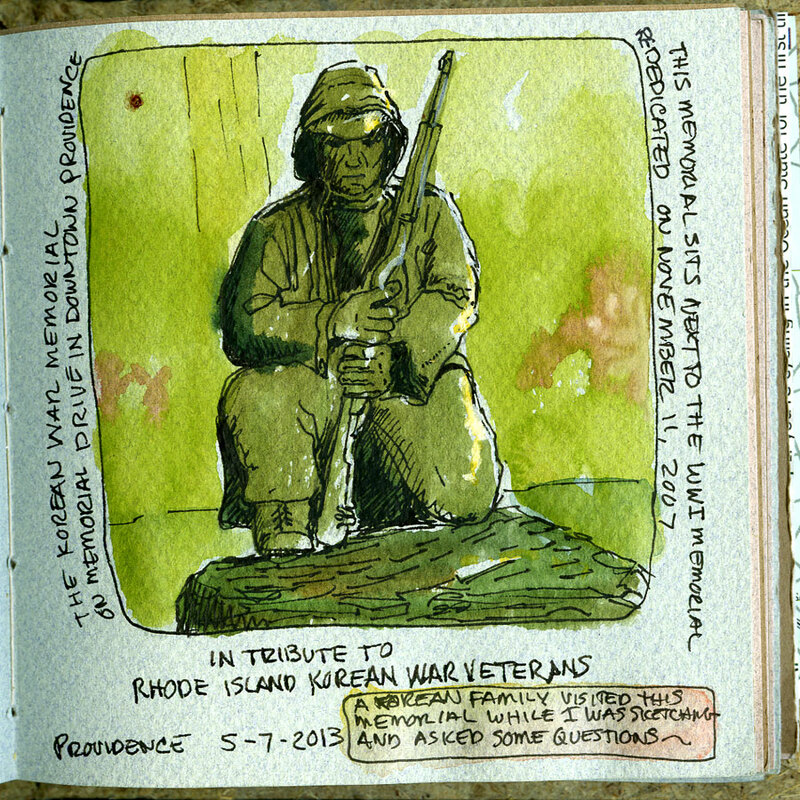 I sketched this WWI Memorial and while it was drying I started the sketch below of the Korean War Memorial. While I was sketching the Korean War Memorial a Korean family came by and took may pictures of the memorial and had some questions, which, fortunately I knew the answers to. They were very grateful to the Rhode Islanders who lost their lives in that war and expressed their gratitude to me. It was a touching moment. 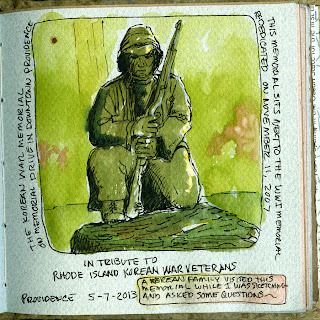 I am afraid my sketched don't do them justice as Edrex called just after I started the Korean War statue - I was rushed --- and never got to finish the WWI memorial either. Maybe I will continue some work on these in the studio.